Fabulous Flowers was a hit! We had so much fun in this class, it was a workshop length class which is 3 - 4 hours long, I taught them roses, fringed flowers - hand fringing and I let them all try out my fringer. I also taught them to create a husked flower. Let me just say, they loved the fringed flowers. The first fringed flower I chose to create out of Bazzill card stock in teal, ivory and a cocoa brown - they turned out soooo cute. We then learned roses, which was trickier; knew it was going to be but they all got it after 3 or 4 tries. Next was a husked flower with a mini fringed flower - as a challenge - they all did great on that too, in fact; a friend of mine took the class and she actually taught me a thing or two with the roses and a new way to fringe flowers - it was awesome. We had some free time so they took turns trying out my fringer machine, which they all agreed would be worth the money; and then a couple gals continued trying to make roses while a few others worked on more fringed flowers. It was fun! Here are some photo's to show what they created. 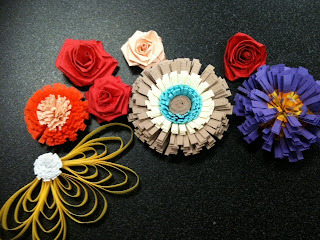 The first image is from the class, we did decide that roses are easier using 1/4" quilling strips instead of the 3/8" strips that we were using for the fringed flowers. A couple of my friends that had taken the class had so much fun, they went back to one of their houses and continued making the fringed flowers; the second photo shows what she created, I love her color combination. She said they were having a blast creating those flowers. Yippee! Next month at Eclectica I'll be teaching a beginners class and a class on birthday elements, which should be fun. Well, seeing all these flowers makes me want to get fringing, I'll post some new things soon I'm sure. 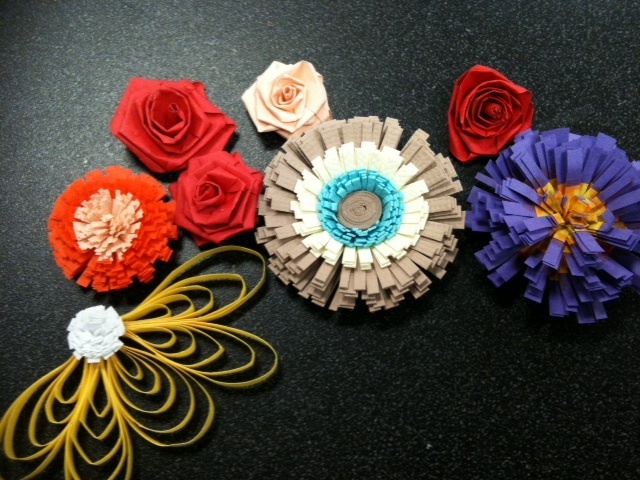 Well another successful quilling class this past Saturday at Eclectica. It was fun, and everyone did great; I taught them how to do a daisy tag and a flower bud acard; both are from Quilled Creations with a smidge of tweaking from myself. 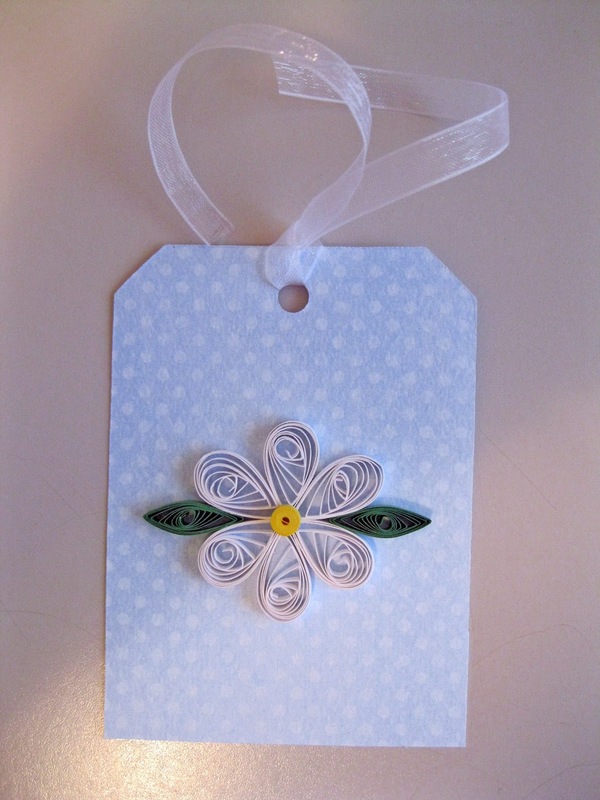 I'm still trying to figure out how many projects to plan, the first class we did a tag with a flower, a snowflake on a card and a pumpkin embellishment and we ran out of time; this time I planned a flower on a tag and a card with flower buds and a small butterfly; and if time permitted some hearts. 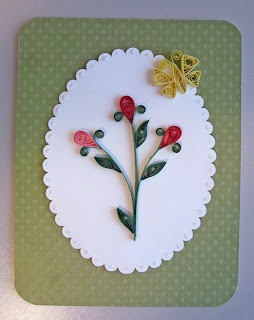 It was perfect, the class was around 2 hours; and I think we may have gone a little over that but we were able to finish the tag and card and one of the gals (who has previous quilling experience) did a couple hearts. 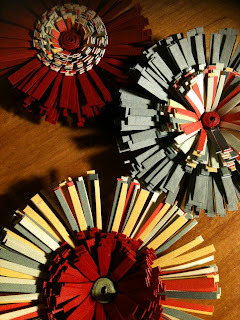 So, I now know to only plan a couple things if it's a beginning quilling class; at the end of the month I'm teaching a quilling class based on flowers - quilled roses, probably a husked flower and fringed flowers; still trying to figure out how to explain roses......anyways, here are photo's of the projects we finished this past Saturday.